Right, enough of this adult fiction, time to enter the children’s book. I would rather call this a children’s book than teen because it is in that weird area of age. It is not a teen book, or young adult certainly, therefore all that is left is children. Having just finished Rhyming Boy I feel you should all remember this day as the first fresh, brand new, shiny review that wasn’t originally anywhere else months ago. A small part of me wishes it was something more adult, but what can you do? There is a quaint sort of charm about this book. There are certainly enough peculiarities about it, but there is a strange allure to these characters and their lives that keeps you reading. 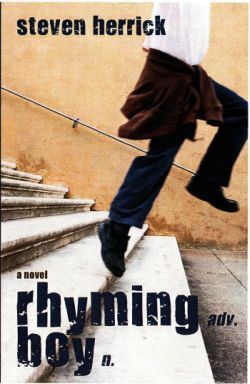 Rhyming Boy is about a twelve year old boy called Jayden Hayden, who loves to read and lives with his football obsessed mother. The book opens with a very accurate depiction of the relationship between the pair, Jayden is trying to read and his mother keeps asking him what the football score is. She apparently is one of these mothers who likes to mock her son for reading a book when he should be focusing on the short careers of famous footballers and their sport. Reviewer’s criticism right there. She herself is strange enough and by the middle of the book her constant, and I mean constant, use of similes will either grow on you or you will cringe. Every. Single. Time. But yes, it all adds to the character and it does help show the little family and their relationship with one another. I will admit I had moments of hating these similes, some which made no sense whatsoever. But there was a great moment in the book when Jayden thinks of his mum and reflects fondly on her similes; that was touching. But they are trying sometimes despite my best effort to see them through a child readers eyes. As a character Jayden is a straightforward kind of twelve year old. The language Herrick has written this in is very much the voice of a child, along with the thought process and rationale. What was a rather intriguing quality about Jayden is his love of facts and the Guinness Book of Records, again something which is seen as strange and different amongst this football focused book. What I did like though what that Jayden describes himself as a wordsmith, and every morning he likes to learn a new word and use it in conversation at some point during his day. He opens his dictionary, points to a random word, and learns what is means. I think this is a brilliant plan, and the execution works rather well, especially in the tone Herrick is after. They are very much the thoughts and experiences of Jayden put onto paper. With that being said, sometimes it is very clear he is a twelve year old. The announcement of a Books and Boys and Breakfast throws a spanner in the works when boys are asked to bring their fathers, uncles, grandfathers or big brothers to come to school and read. As a result Jayden begins the quest to track down his dad with the help of his new friend Saskia. You can easily see why Saskia is introduced, and why they gel together so well as friends. Saskia is the same as Jayden and gives him a companion who likes all the things he does. Her house is filled with books, she helps him research and find his dad, and she is a nice addition to this boys teasing boys, rough football mentality the book has going on. It was interesting to see the world through this kid’s eyes, you can see as he looks for his dad how he constantly assess every one else and their fathers. Saskia’s dad is quirky, the kids next door’s father plays football with them to a hint of obsession, and there is the classic ‘let’s see why the bully bullies’ relationship as well. Those aspects alone I think were good because you can see how a child reading this could take so much from it about being from a single parent family, being teased for something you can’t change, or just feeling different. And the fact a child’s voice is telling you this story, you get the anger and hurt and inexperience as well. That was done rather well actually, angry Jayden thoughts and sarcastic Jayden were my favourite sides of him. This is a fairly quick read and not a lot of story aside from the father hunt, and by the end of the book there is minor closure, in a strange and almost unsatisfying way. But you can see the reality of the situation and Herrick does not try and make anything seem too perfect. There is certainly turmoil as things never go to plan and it shows how easily a child can raise and lose his hope. What was good was that while Jayden was unique in a way, he is just like every other twelve year old. He tries to please his mum but he still wants answers, and he is very good and controlling what he can in his world and using his wit and intellect to deal with confrontation, though not in a smart arse way. Not out loud anyway. He makes things happen and he gets himself out of unintended trouble quite well. Reading this and being out of its designated age bracket, you can easily see that Jayden doesn’t really need his father. He has pretty wonderful male role models and people around him, but you do also understand how seeing everyone else having something you don’t have makes you want one of your own as well. It is certainly a strangely written book but beneath this sort of organised chaos is a charming story, and I am rather glad it turned out as it did really.